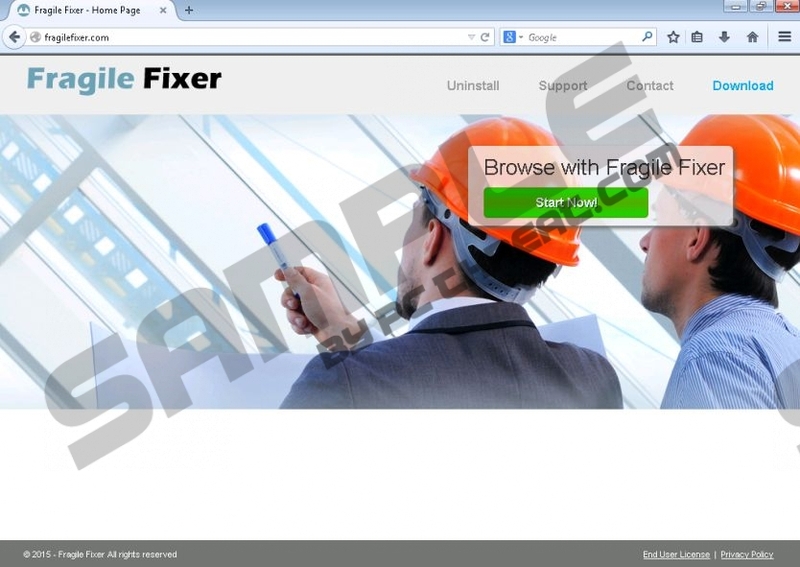 SuperWeb LLC has recently unleashed a new advertisement-supported program called Fragile Fixer, and it is only a matter of time before this program is spread across the web. At this moment, the download button on fragilefixer.com is inactive, but it is unlikely that it will be activated. Most, if not all, SuperWeb applications are presented via official websites that do not offer installers. Are there many SuperWeb apps? There might be thousands of them, and all of them deserve removal. Needless to say, users have to delete Fragile Fixer as well, and we have created this report to help you understand why this is important. The distribution of SuperWeb programs is very unpredictable, and we cannot say which one of them you will need to delete from your PC. In most cases, these programs are distributed using software bundles, but it impossible to say if all users will install the same adware even if they employ the same installers. Regardless of which SuperWeb program you encounter, you need to remove it as soon as possible. Lucky for users, Wild West, Zoom Zoom, Air Globe, and all other Fragile Fixer clones act in exactly the same manner, which means that they can delete Fragile Fixer and other infections using the same methods. Even though the removal of Fragile Fixer is straightforward, there are still many users who are unfamiliar with SuperWeb and who don’t know much about the risks that could be imposed upon them. The truth is that you must remove Fragile Fixer; otherwise, this application will contact remote adware servers and allow them to display completely unpredictable advertisements that are usually presented with the tags "Ads by Fragile Fixer" and "Provided by Fragile Fixer.” Regardless of how attractive these ads might be, you cannot trust them, because they could be employed by schemers. You might know already that schemers use malvertising attacks to distribute malicious programs that also require removal, and you don’t want to deal with that. Make sure you delete Fragile Fixer to avoid all security risks. What are you going to do about Fragile Fixer? Will you remove this advertisement-supported program from your operating system? Since this is what we recommend, we have created a removal guide that should help you delete Fragile Fixer. Do you have a trusted malware scanner? If you don’t, we advise installing SpyHunter. This scanner will let you know if the removal of Fragile Fixer goes as expected. If the scanner detects leftovers of this infection, you can try to delete them manually, but we advise upgrading the scanner to an automatic malware remover that can ensure the full removal of all computer threats. Click the Start button on your left and open Control Panel. Double-click Add or Remove Programs and locate Fragile Fixer. Right-click the application you wish to delete from your computer. Click Uninstall and complete the removal process. Quick & tested solution for Fragile Fixer removal.